Until recently I lived in Scotland where UV is hardly ever an issue given the hideous weather we tend to get there. However, I now live in New Jersey in the USA where the summers can be very hot and the risks of UV exposure are more of a concern for me. Given that I took my weather station with me when I relocated (which comprises of both the WMR88 and WMR200 base stations) it made sense to consider expanding its capability to record UV. 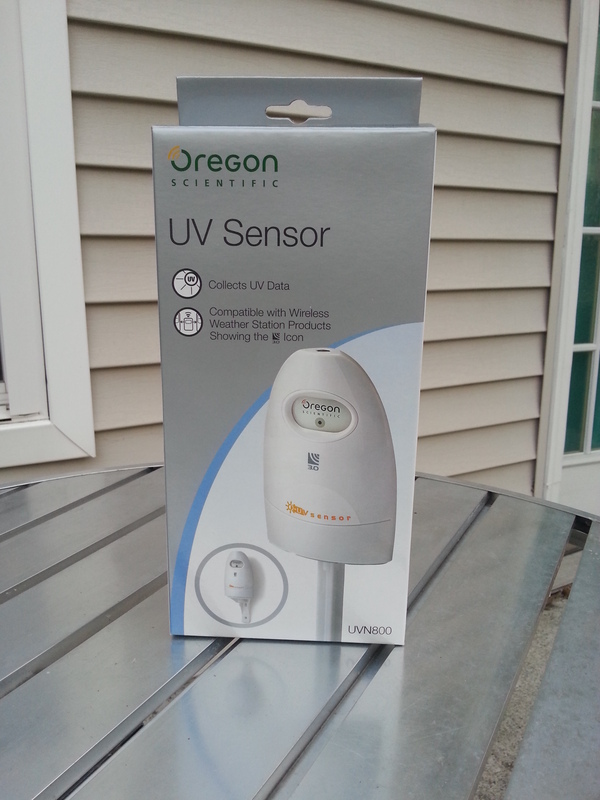 One of the advantages of Oregon Scientific’s range of wireless weather stations is the ability to add extra sensors. I have, for example, previously taken advantage of this by adding an additional temperature and humidity sensor in the form of a THGR810 unit. 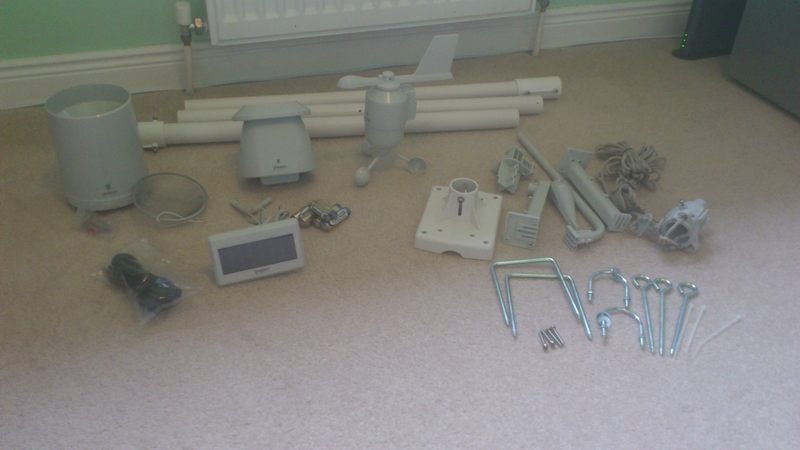 Upon unboxing I was presented with the UVN800 unit itself, a wall mount with two screws, a ground spike, AA batteries and instructions. This provided me with two different installation options. Either use the ground spike to insert the sensor in the ground or the wall mount and screws to attach it to a wall or pole. I chose the wall mount option which I attached to my existing sensor pole. However, I appreciate the flexibility of the ground spike option. The trick with the UVN800 is to orient it such that the UV sensor on top of it has a constant, uninterrupted view of the sky which I could more easily achieve with the pole mounting. Installation of the UVN800 is fairly straight forward if a little more awkward than it could be due to some weird choices made by the unit’s designers. First of all accessing the battery compartment requires the removal of four small screws from the base of the unit to access the battery compartment. Why the compartment is not accessed by a sliding mechanism like most of Oregon’s sensors is a mystery. Secondly the wall mount is screwed into place at the bottom of the unit obscuring the battery compartment and reset button. Given my pole mounted configuration changing batteries will be far more time-consuming than it should be. I will have to unscrew the wall mount from the pole, detach the sensor from the wall mount, remove the screws from the battery compartment. Only then can I change the batteries and will then have to reverse the procedure to reinstall the unit. So far this is my only gripe with the UVN800 and it is not a deal breaker by any means. One the batteries were installed pairing it with my base stations was as simple as hitting the sensor’s reset button and initiating a search from each base station. 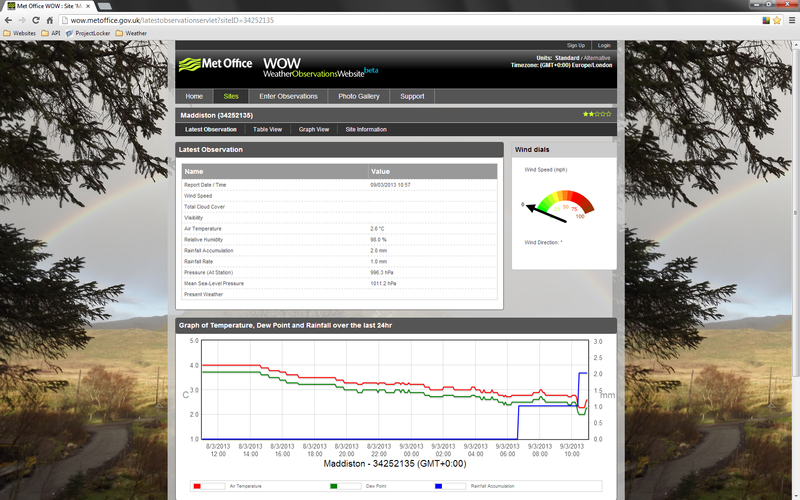 They both started displaying UV Index readings straight away. 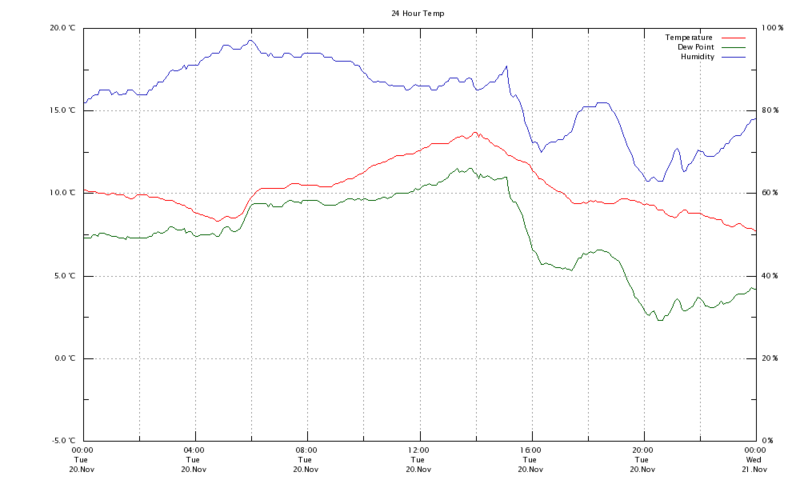 On both the WMR88 and WMR200 this takes the form of a live UV Index display and a graph of the last 10 hours of values. Returning to the UVN800 itself there is one more thing to note. The reviews on Amazon for the UVN800 indicate that many units permanently fail just after a year of operation. At the time of writing I have only been operating the sensor for a few days but will add a note to this review if and when it fails. Should the sensor last at least a couple of years (as all my other sensors have already done) then I would not hesitate to recommend the UVN800 as a useful, easy to use addition to an existing Oregon Scientific wireless station. The Meteo Sheeva fulfills all of these requirements and then some. A Meteo Sheeva is actually a combination of two things. Firstly there is the “Sheeva” part. This takes the physical form of a SheevaPlug Linux-based compact computer. Secondly there is the “Meteo” part. 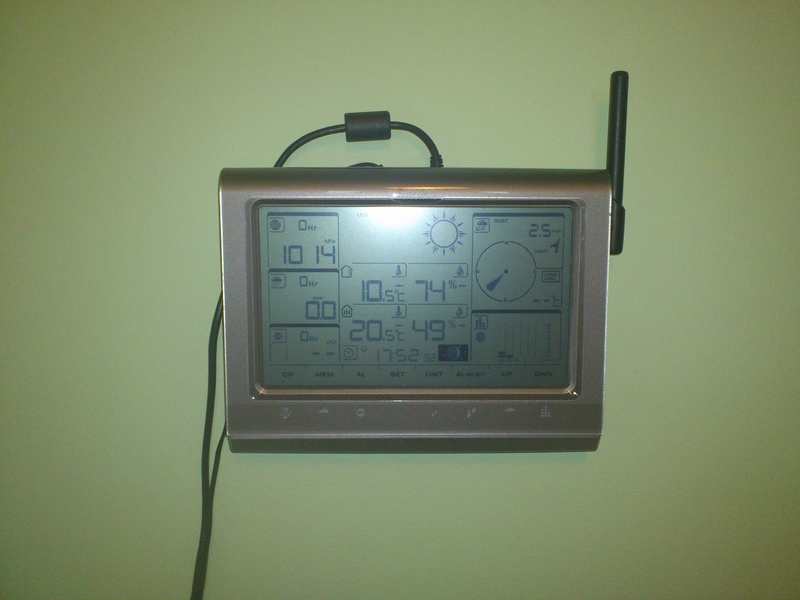 The Meteo Sheeva ships with an SD Card preloaded with a demo version of the Linux-based MeteoHub data logger software. I purchased the Meteo Sheeva unit from a UK vendor called New IT for £130 and licensed the MeteoHub software from Smartbedded for £50. For me this is a relatively low price purchase compared to dedicating a full size machine to data collection. I could have created a data logger for less money by configuring a Raspberry Pi with, say, wview. 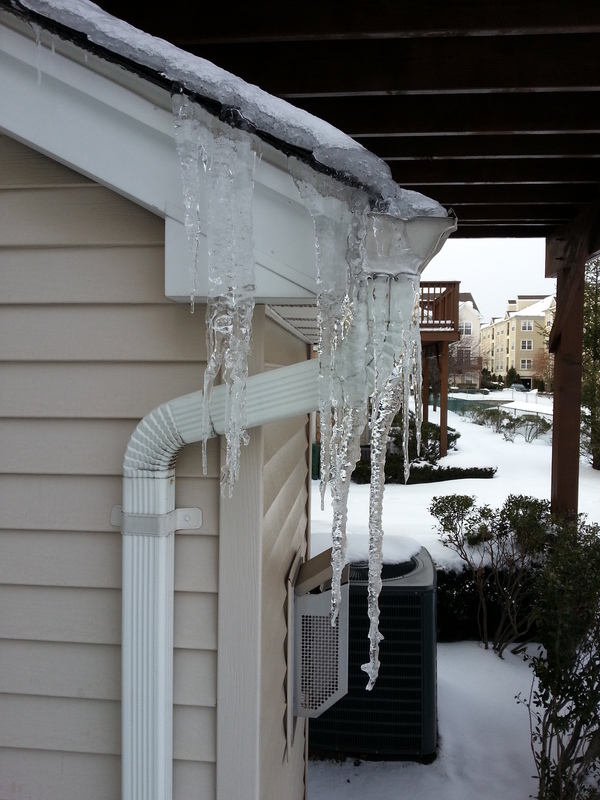 However, I was more interested in my particular solution being turn-key in nature than in saving more money. 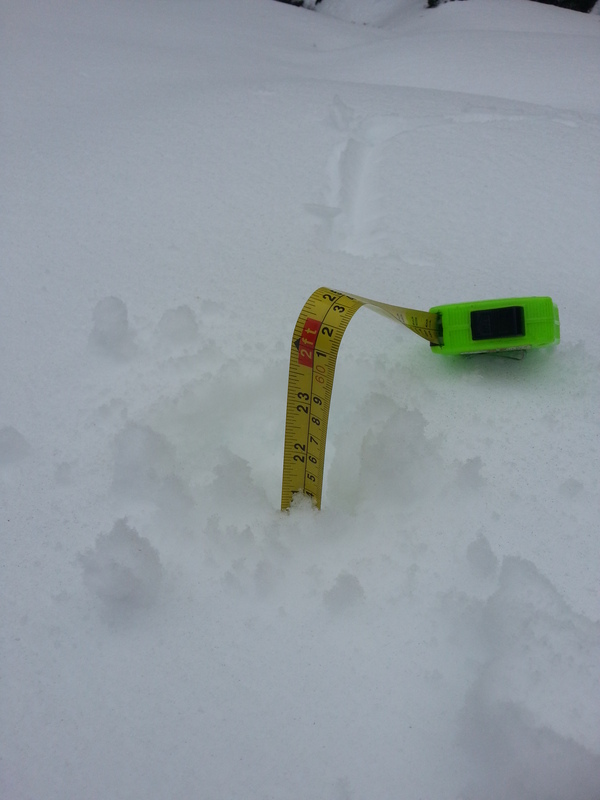 The SheevaPlug fufills the compact requirement as it measure only 11 x 7 x 5 cm. This makes it bigger than a cased Raspberry Pi but still small enough to tuck out of sight. This picture shows my SheevaPlug next to a beer mat for comparison purposes. Like the Raspberry Pi the SheevaPlug runs off of a SD Card. It is powered off the mains via a detachable radio type power cable. 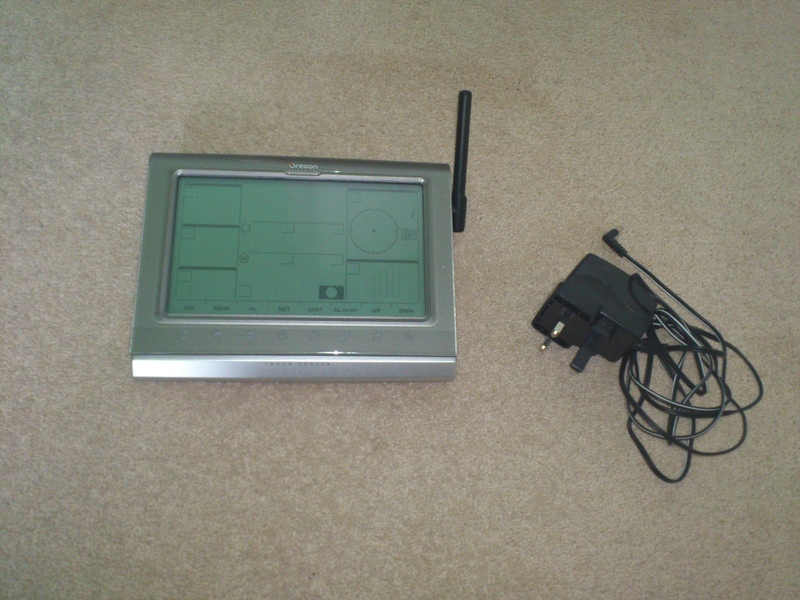 For connectivity it has a USB socket to connect to a weather station and has an ethernet port for networking. The unit’s setup is indeed turn-key and couldn’t be much easier. 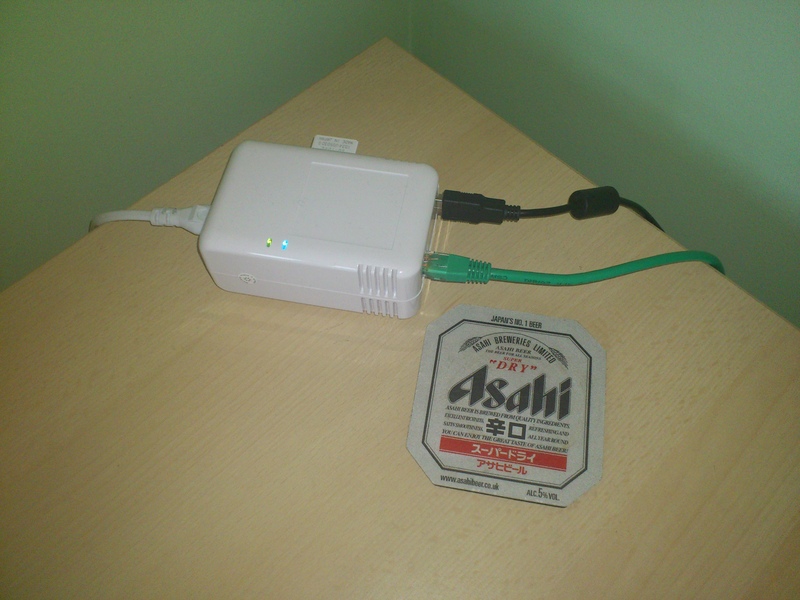 I simply connected the SheevaPlug to the mains, attached it via USB to the WMR200 and to my router using an ethernet cable. 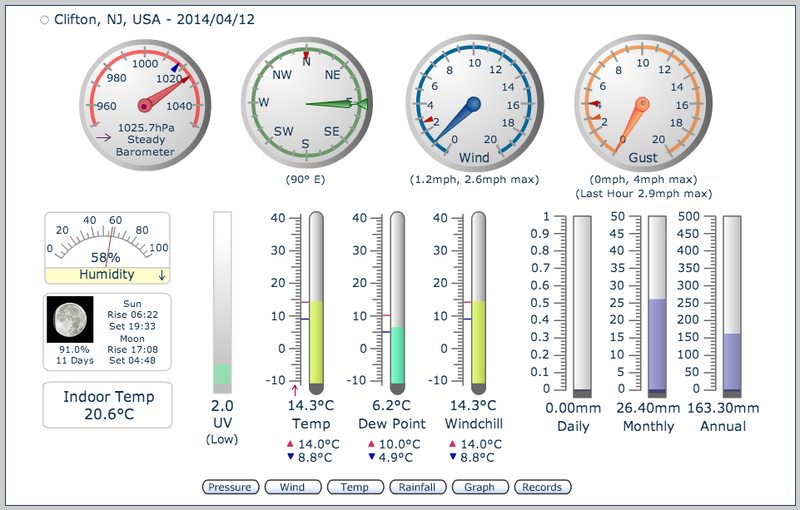 Once powered up all interactions with the MeteoHub software are made via a web browser and a simple web-based UI. All I had to do to start data logging was access the Weather Station section of the UI, specify that a WMR200 was connected and then select which of the automatically detected sensors I wanted to log data from. The MeteoHub manual is excellent. The manual covers every detail of the software’s capabilities. This is invaluable, not because the MeteoHub software is difficult to use, but because of the massive amount of functionality it provides. I will describe a small subset of the main features which I have found to be the most useful for my own requirements. 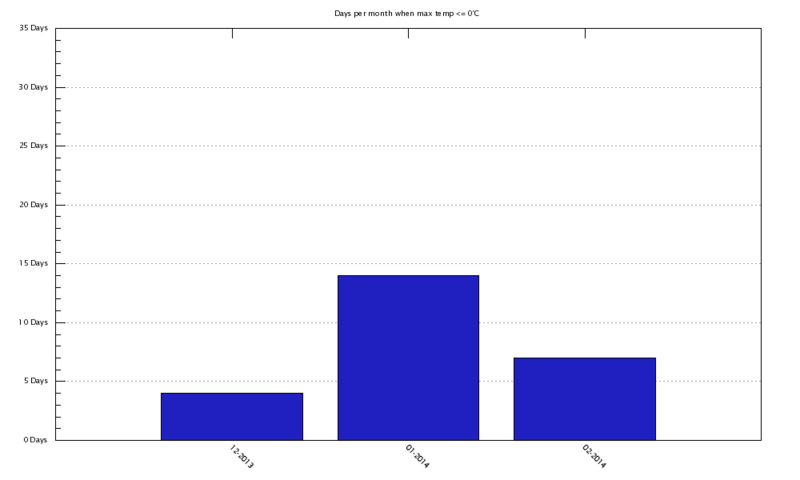 Bear in mind that MeteoHub is capable of much more than I make use of. 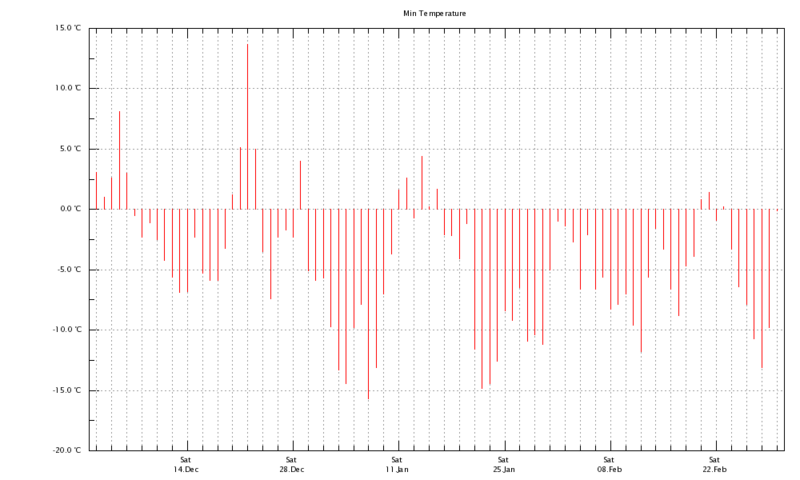 The first feature I started experimenting with was the ability to specify charts from the logged sensor data. I focused on bar and line charts but there are many more options available as well as flexible configurations for time period, aggregation buckets, scales and colours. With limited UI-based configuration I was able to create charts for all of my weather data types over many different time periods. 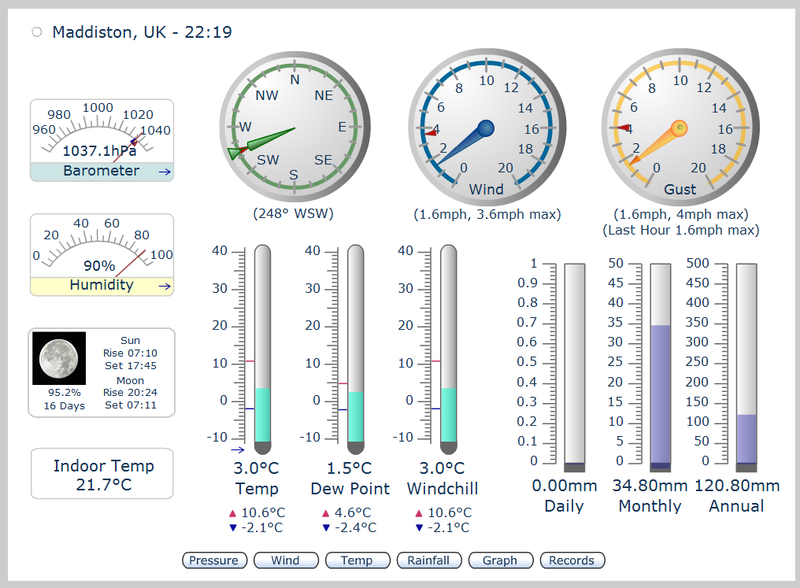 Any of the charts can be displayed via the MeteoHub UI at any time. 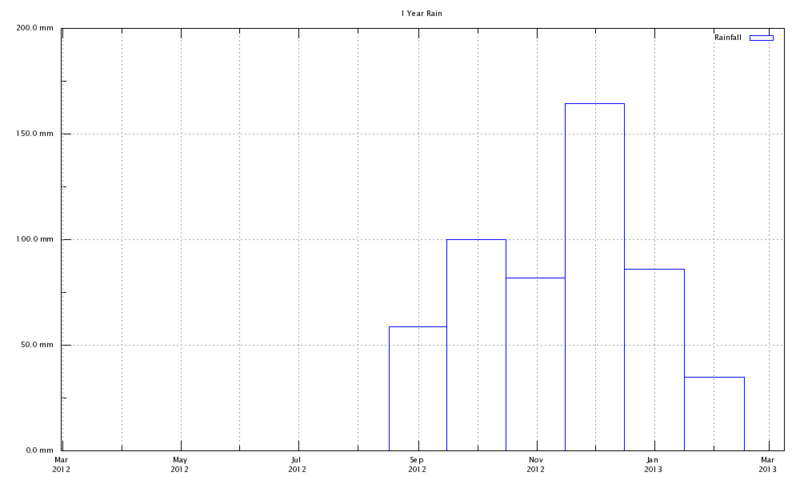 However, the charting feature really come into its own when combined with the automated FTP upload feature. 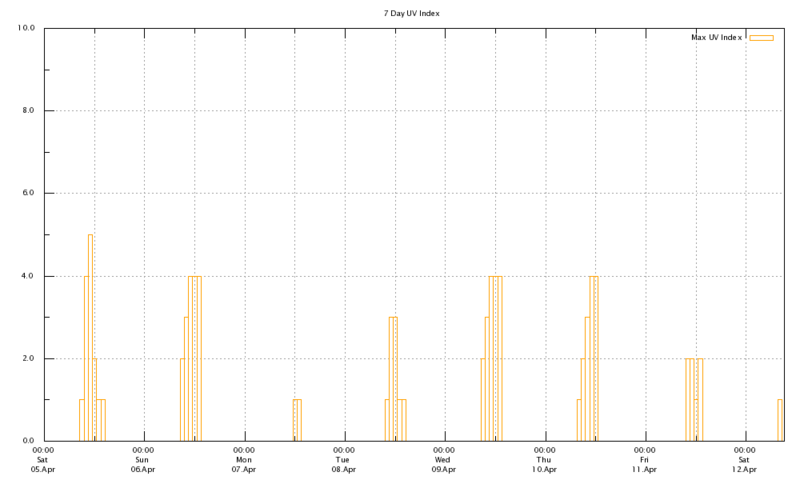 This can be used to publish updated charts to a website on a pre-defined schedule. I use this feature to publish my setup’s charts to my own weather website. 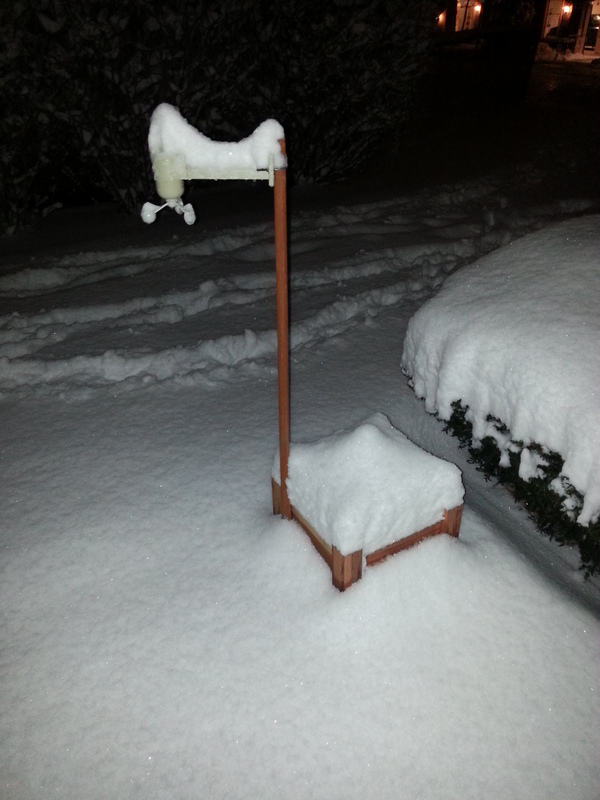 In short I cannot recommend the Meteo Sheeva highly enough as a weather station data logger. Even though I only take advantage of a subset of its capabilities the features I do use make use of make it more than worth the money I have invested in it. You can get a cheaper and smaller solution using a Raspberry Pi. However, if you want something that works out of the box then the Meteo Sheeva cannot be beat. Six months ago I did exactly that and purchased an Oregon Scientific WMR200. The idea was to compliment, rather than replace, my existing setup. 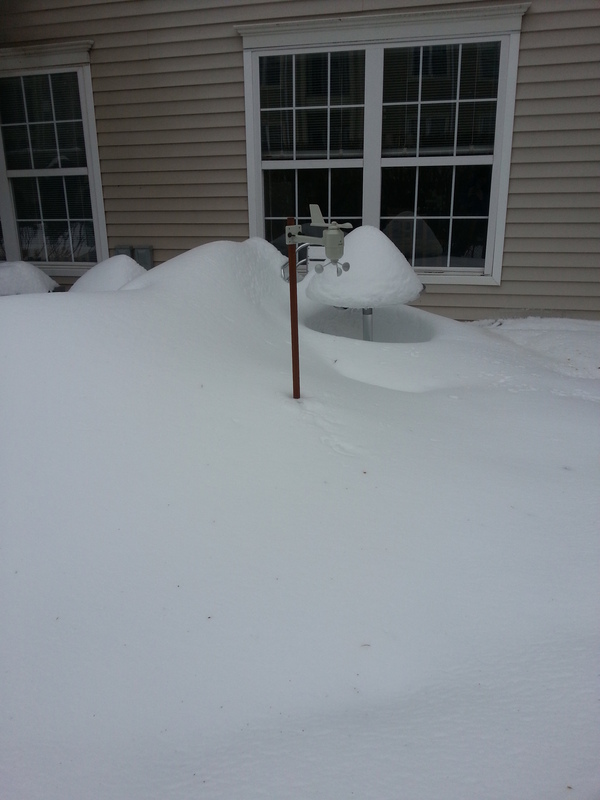 This post details my experiences with this new weather station. Note that in this post I tend to compare the WMR200 with the WMR88 so you may want to read my original posts on that first. 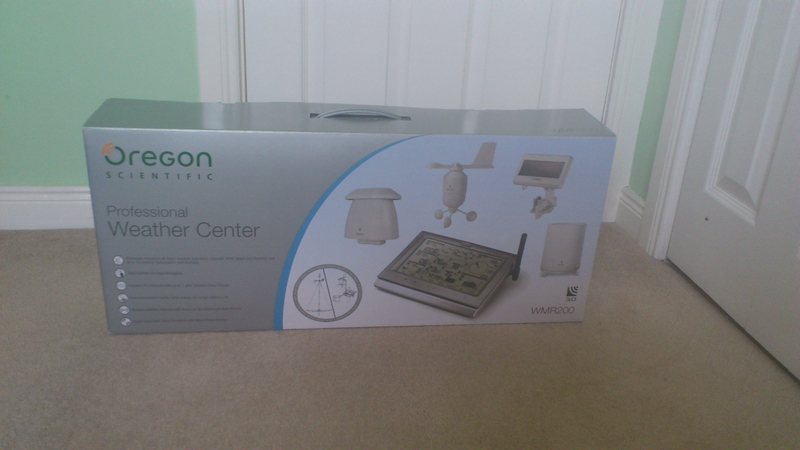 The WMR200 currently retails for £400. However, Amazon, Weather Shop UK and Oregon Scientific themselves tend to offer the unit at up to £120 cheaper from time to time. It pays to be patient and wait for such a deal rather than pay full whack. I ordered directly from Oregon as they had the cheapest price at the time. The included kit allows for a lot of flexibility as to how the sensors are installed, more so than the cheaper WMR88. All sensors bar the rain sensor can be placed together in a single array using either the supplied pole or an pre-existing one. Alternatively sensors can be distributed across separate locations using the supplied brackets. For example, attached to fences or buildings. The supplied pole which, in combination with the supplied ropes, fasteners and stakes allow for the option of a ground mounting which gives substantial height to the sensors. 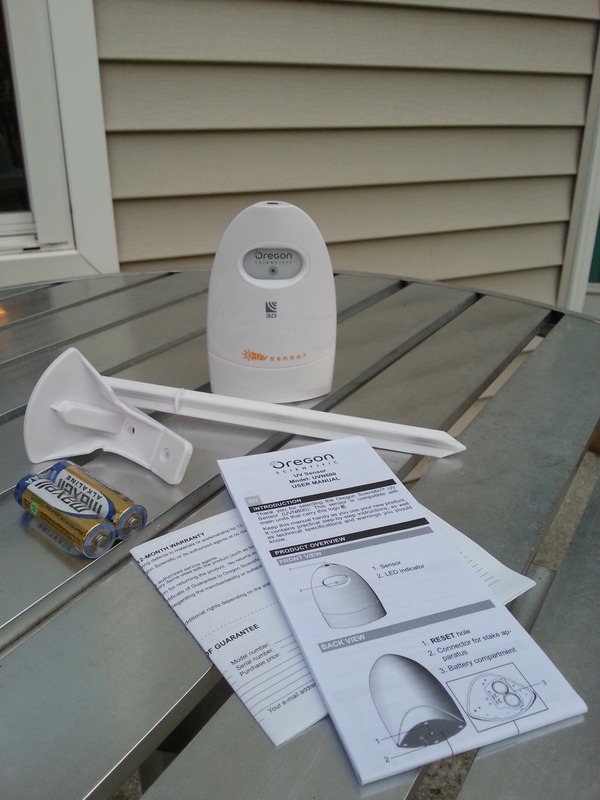 The WGR800 wind sensor supplied with the WMR200 is the same as the one that comes with the WMR88. 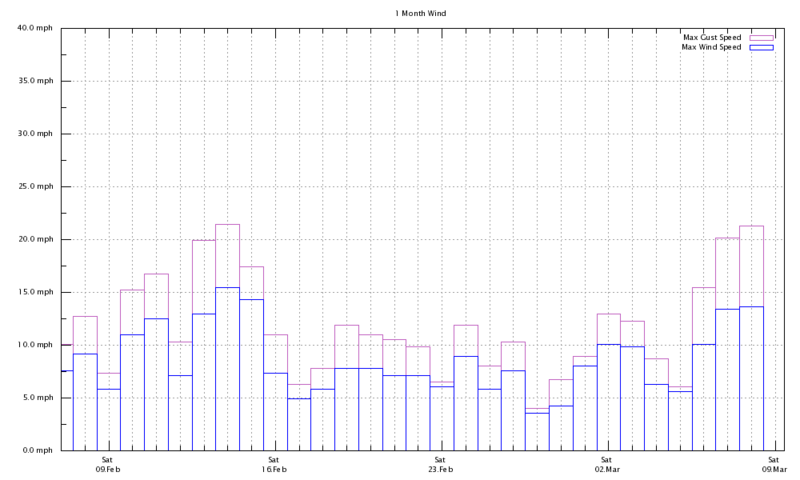 The curious thing is that the WMR88 manual states that its wind sensor transmits a signal every 56 seconds while the WMR200 manual says signal transmission occurs every 14 seconds. 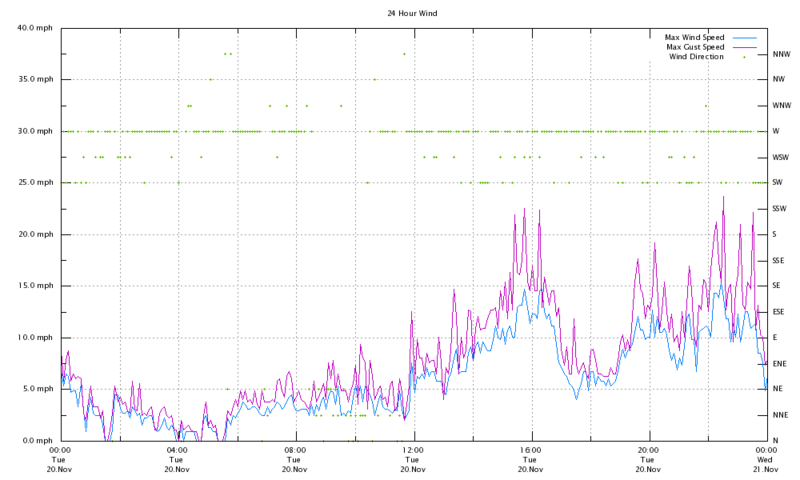 Certainly each station updates their displayed wind readings at the stated intervals. 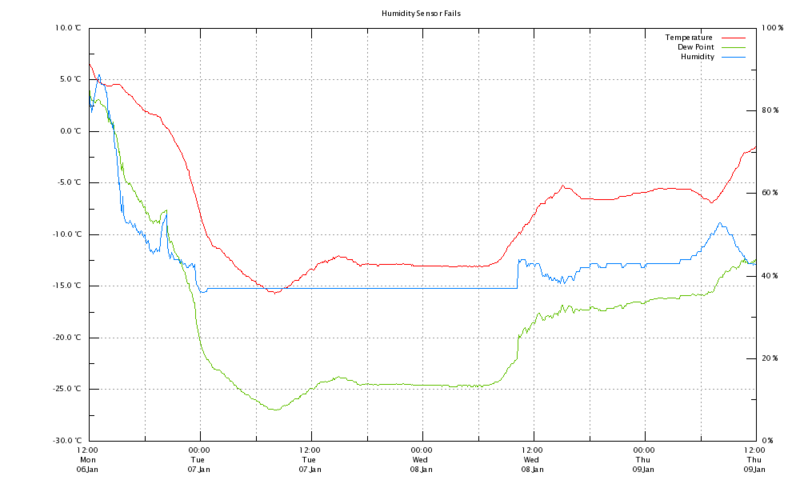 Clearly the longer display interval on the WMR88 base station is a limitation of the base station rather than the wind sensor which transmits more frequently. The THGN801 temperature/humidity sensor that comes with the WMR200 is shielded unlike the THGN800 that came with the WMR88 (I had built a shielded housing for the THGN800 which I can now decommission). While the THGN800 had clearly been superseded it was not completely obsolete. I simply changed its broadcast channel from 1 to 3 and moved it into a room in the house so I could see readings from there (as detailed here I had already installed a THGR810 sensor on channel 2). The STC800 solar panel is a nice addition as it helps to power the WGR800 and THGN801 and will hopefully save on replacement batteries. It has two cables attached to it which can be plugged into each of the aforementioned sensors. The connections look to be well insulated and the supplied cable ties can be used to attach the power cables firmly to the sensor brackets. 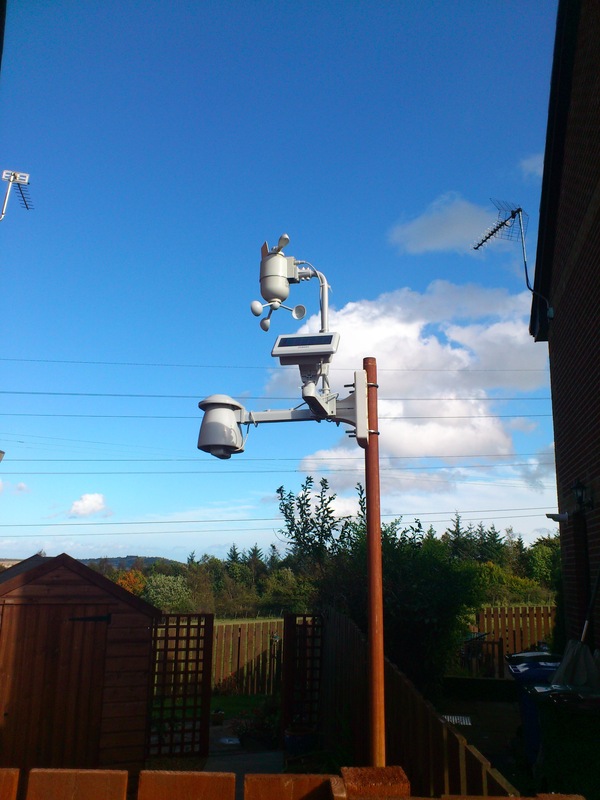 I had no cause to replace or move the existing rain gauge as the same rain sensor is supplied with the WMR88 and WMR200: the PCR800. The bonus with the WMR200 is that you get a rain filter in the form of a fine metal grille to place in the gauge to catch debris. I have placed this in my existing PCR800. 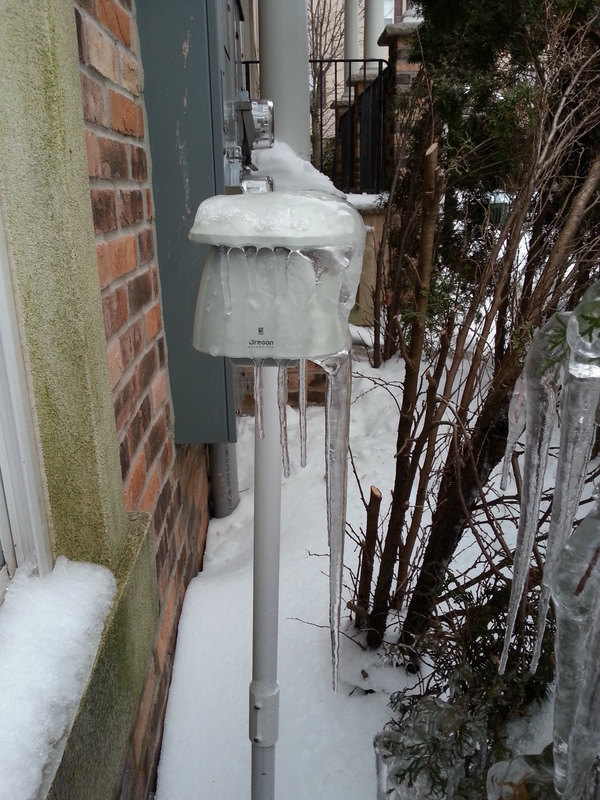 See my previous post for details of the PCR800’s mounting on the side of my shed. All of the sensors now in place are compatible with both the WMR88 and WMR200 base stations. 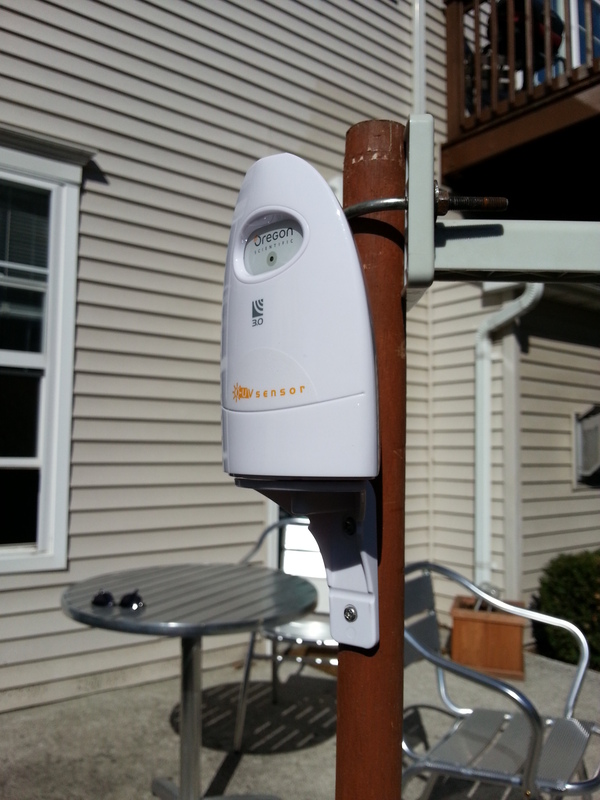 As the sensors simply broadcast both base stations can receive data from all of the sensors. 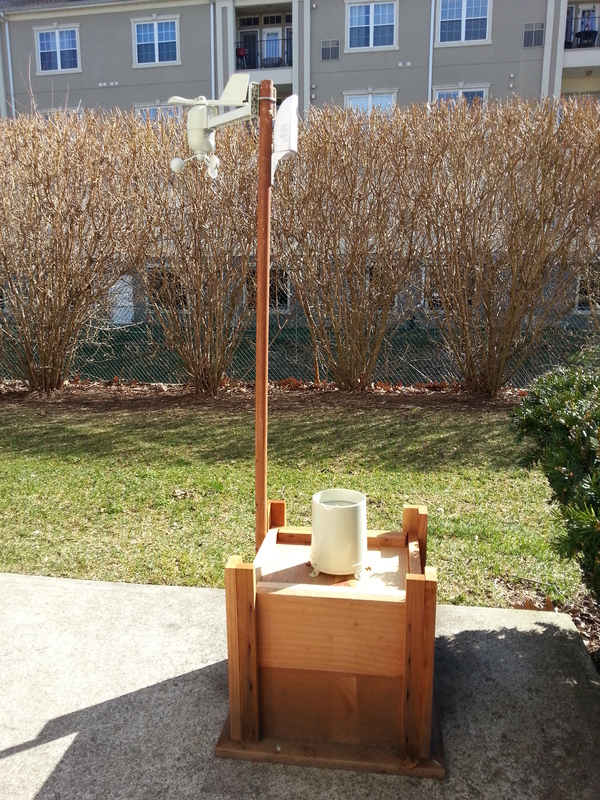 This hybrid setup has also provided me with unused backup sensors for both wind (WGR800) and rain (PCR800). Given the extortionate cost of replacement sensors these are handy items to have in case of failure in one of the original sensors. The WMR200 base station is a super-charged version of the WMR88 capable of doing everything the cheaper unit can do and more. First I will cover the similarities between the two before looking at the differences. Like the WMR88 the WMR200 functions as an internal temperature and humidity sensor and as an air pressure sensor. The WMR200 has an optionally backlit LCD display similar to the WMR88. The WMR200 also features the same clock synchronisation feature as the WMR88. Both units can be powered from the mains and be loaded with backup batteries. The WMR200 displays the same information as the WMR88 (temperature, dew point, humidity, wind, rain, pressure, UV, historical highs and lows, forecast, moon phase and current time) but its larger screen means that it can display more of this information at the same time. For example, the WMR88 can only display one set of temperature and humidity readings at a time while the WMR200 can display the internal base station readings and the readings from a selected channel simultaneously. The WMR200 can also display rain, UV and atmospheric pressure readings at the same time while with the WMR88 you have to cycle between the values. 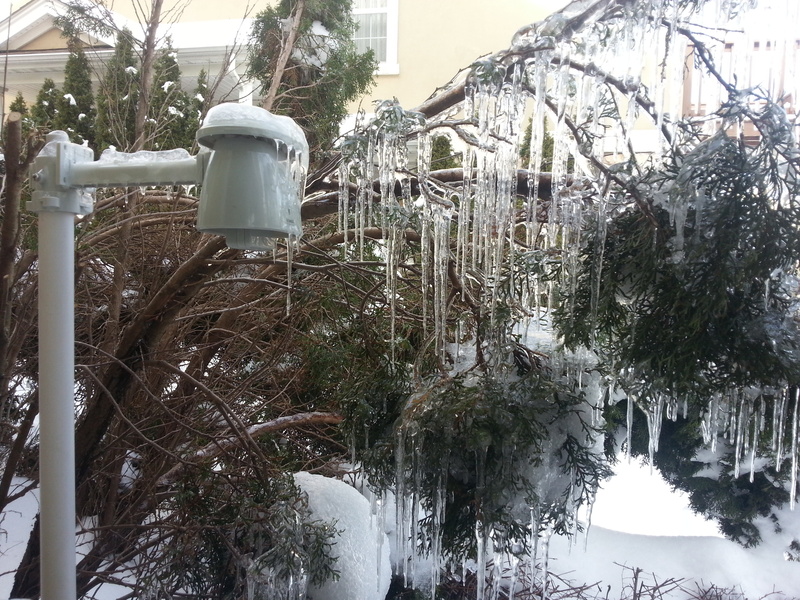 This makes it possible to review the current conditions at a single glance. The WMR200’s screen features a resistive touch screen rather than the physical buttons of the WMR88. 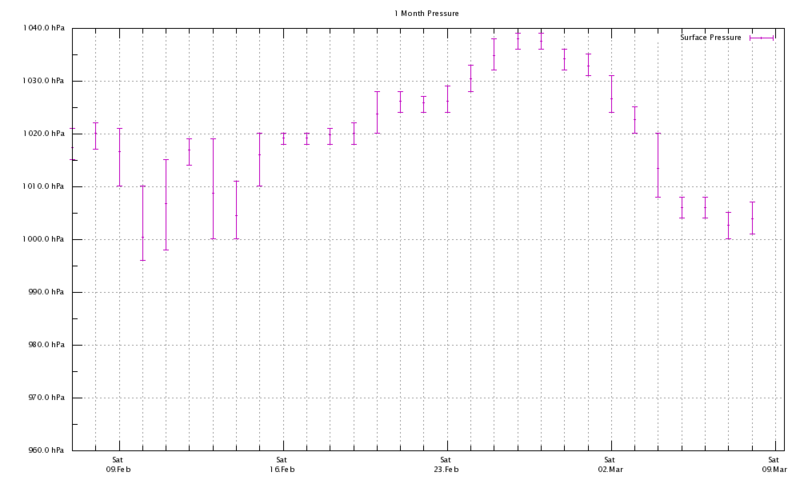 This makes the operations of cycling between sensors, checking highs and lows, etc far more intuitive. Unfortunately the WMR200 has preserved the WMR88’s annoying feature of beeping whenever the touch screen is pressed. This again cannot be switched off. 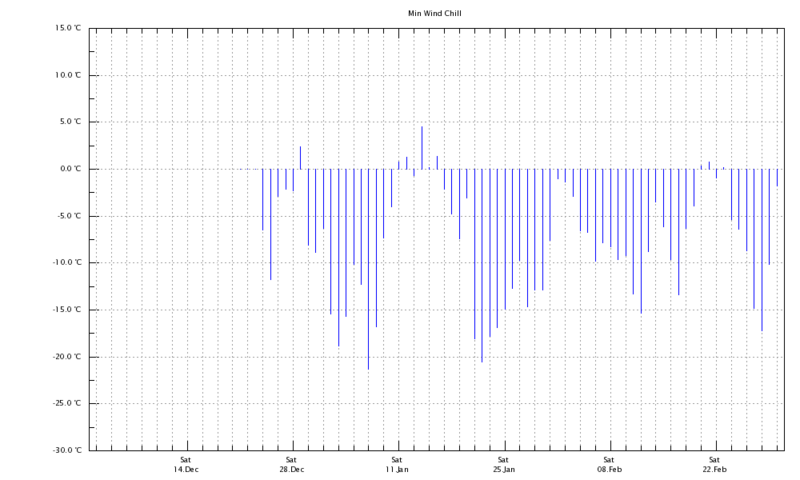 The WMR200 also functions as a data logger. However, Oregon Scientific’s included software remains as useless as ever so accessing the stored data is nigh on impossible. This is not an issue for me as I now use an external data logger connected via USB (more on that in a future post). The WMR200 supports up to 10 channels and therefore up to that number of temperature/humidity sensors while WMR88 only supports 3 channels. The final advantage of the WMR200 over the WMR88 is the external antenna. 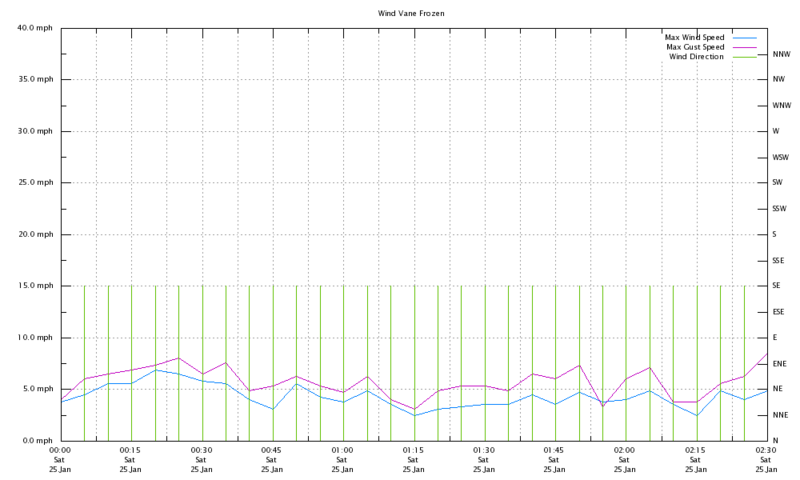 Oregon Scientific’s wireless weather stations are famously awful at reliably picking up remote sensors. I did not expect a great improvement with the WMR200’s rather tiny antenna but at least it gave me scope to apply simple modifications to improve performance which I could not hope to accomplish with the WMR88’s internal antenna. So is the WMR200’s external antenna more reliable than the WMR88’s internal antenna? That is difficult to say. What I can say is that it is far from perfect. My first site for the WMR200 was less than 10 meters from all sensors with an internal wall and brick wall inbetween. This location gave intermittent signal issues. A complicating factor was that this location was also my office and contains my laptop and router. I suspect that these may have been responsible for some interference with the signal. Since the base station move and my simple modification I have experienced minimal signal drop outs. Specifically, a few weeks apart and lasting no more than 5 minutes. This is more than acceptable for my purposes. Getting the best from the WMR200 appears to be a combination of closest location to sensors, line of sight to sensors or minimal obstacles, minimal electronic interference and putting more metal in the air. 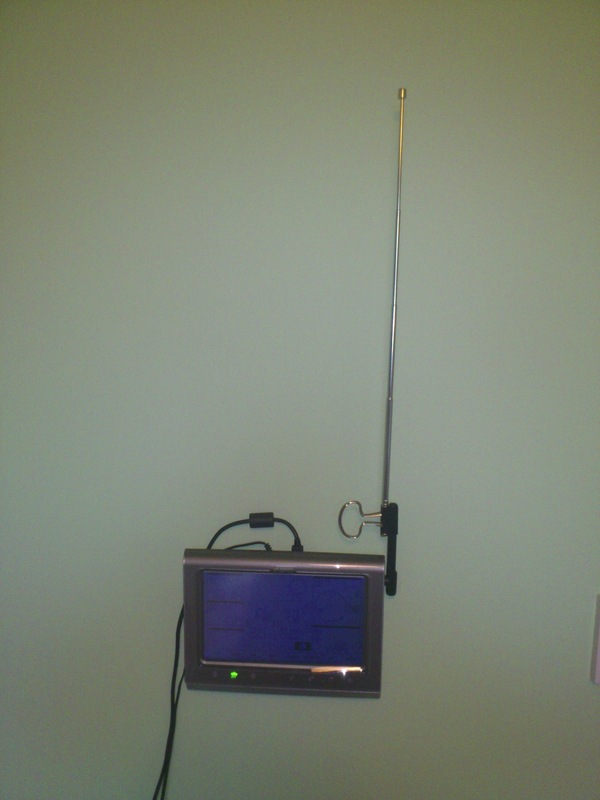 I have attached my data logger via the supplied USB cable to the WMR200 through the wall. The WMR88 has been relocated to the living room downstairs for display purposes. Handily this means that I can now check the current conditions without changing floor. 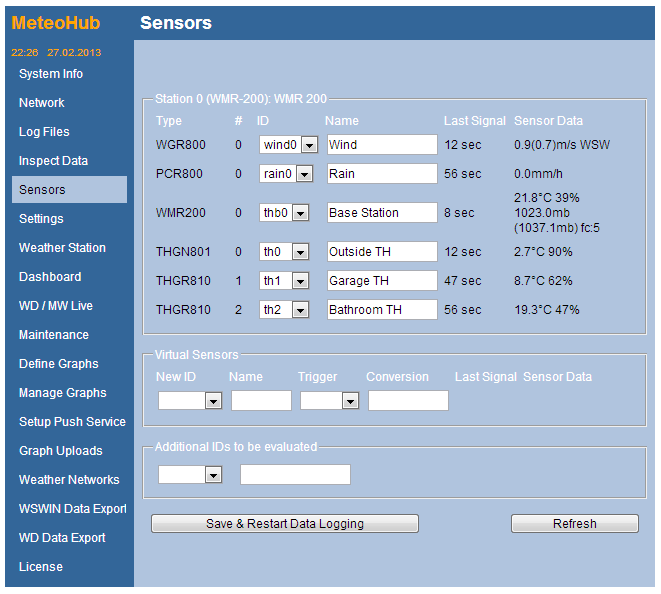 On the subject of the data logger I have installed a SheevaPlug running Meteohub weather server software. I will detail my experiences with the data logger in an upcoming post. For now it will suffice to say the SheevaPlug/Meteohub combo is a nice piece of kit that is easy to set up and is feature packed. I am happy with the WMR200 now that I have it working reliably. The antenna issues make it far from plug and play and any prospective buyers should be prepared to put a lot of effort into minimising signal drop outs. In hindsight I would have bought a WMR200 in the first place rather than the more basic WMR88. On the other hand, I find the flexibility of having two base stations to be the perfect setup and an advantage of having a wireless as opposed to a wired weather station.